Superb translation of Kaiju to 5e - must-own! 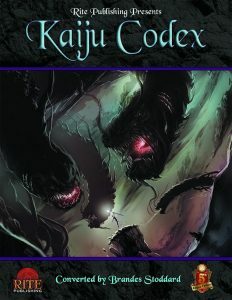 The 5e-version of Rite Publishing’s superb Kaiju Codex clocks in at 49 pages, 1 page front cover, 1 page editorial, 1 page SRD, 1 page advertisement, 1 page back cover, leaving us with 44 pages of content, so let’s take a look! We all have been there at one point, at least once we have a certain amount of experience under our belt; the point where the tarrasque looks…kinda unimpressive, but when it has actually been done in a campaign. At that point, we are looking for other ginormous creatures of immense power, we’re looking for mythic, impressive, really, really big adversaries. Well, the Kaiju Codex seeks to provide exactly that. Kaiju, much like the tarrasque, are as much plot devices as they are monsters, They are not necessarily made to be vanquished. In the same way that you can’t knock out a hurricane or an earthquake, they are challenges for the most epic of heroes – and frankly, even these may well be outclassed by them. Now, as monsters of such an epic proportion, it should come as no surprise that the Kaiju depicted herein have legendary actions at their disposal – moreover, they are ridiculously large creatures – Colossal, in fact. Thing is, 5e per default does not have rules for that, so you should be aware of the fact that, by virtue of sheer size, the kaiju featured herein take less damage from most attacks by smaller creatures – half damage, in fact. Only level 9 spells and attacks by similarly monumental creatures still inflict the regular damage value and yes, the kaiju depicted herein can further decrease that amount via resistances and saving throws. Cool: Siege Monster does actually work against them, which is a nice touch in the details. Now, build-wise, the kaiju depicted herein will make some of you who are more mechanically-minded scratch their heads for a second – you see, the attack values and damage values seem to be wonky at first glance – there is a reason for that: If a kaiju’s Constitution modifier exceeds the Strength or Dexterity modifier of the respective creature, it is used instead of these as a governing attribute. I’m primarily mentioning this for the convenience of my readers, so should you endeavor to rebuild these, well there you go. Now, format-wise, there are obviously weird anime-esque kaiju herein; but similarly, you’ll be able to find ones steeped in medieval mythology as well. All kaiju featured herein come with excellent, full-color artworks. It should also be noted that you are not restricted to use them as Cloverfield-style backdrops/plot-devices – we all know that players want to fight ridiculously massive monsters and the pdf does acknowledge this- via the inclusion of the iron giant. Whether Saber Rider’s Ramrod or the more well-known mega-zords, the Iron Knight takes that role – it is basically a massive mech that is piloted by the collective of the party. There are four key-roles for crewing the mech, meaning that even smaller groups should be capable of using it: Commander, Driver, Engineer and Gunner, though, to be honest, none are required to properly use this massive construct – so yeah, whle not ideal, smaller groups can pilot this massive mecha, though occupying a position also means that the mecha’s effectiveness increases. An artifact, the Star of Daikaiju, btw. allows you to command kaiju – so that would be another option to introduce them in your game; perhaps the villain has it; perhaps the PCs get the artifact and command a kaiju (hand them the stats and watch the PCs go to town with the kaiju – did so once in my campaign and it was epic…), so yes, the book allows for a variety of different uses of kaiju. The colossal monsters introduced herein don’t necessarily need to be evil or ugly, mind you – there would, for example be a thoroughly cute flying squirrel-style being; the mighty Adam, the Defender; strange quasi divine beings like Inu or the ridiculously massive Hurbun, the big goblin – while the latter is evil, he also represents a trope that more than one player will most assuredly enjoy. Of course, really twisted monstrosities are found within the pdf – from the Beast of the Deepest Depth to Great Charybdis, we have some nasty threats herein that represent the classic idea of colossal creatures lurking in the abyssal depth of the ocean. Of course, the trope of the dread thing from the stars also is covered – with e.g. Neuros, the Brain between Worlds or “That Which the Stars Rejected”…and there is the “Voice from Beyond”, which should put a BIG smile on fans of the classic Kull-stories; the sentient perfect storm, a natural force of annihilation; a mech designed by the ant-like formians; the dread drainer of giants; Inu and Iruk, which could have jumped straight from eastern mythology…there are a lot of amazing beings within these pages. Xel’unchek, a living diabolical siege engine, and Yssian, the abyssal engine, would make for planar weapons of mass destruction that most assuredly should be more than capable of ending blasé reactions to the forces of the outer planes. Particularly creepy for me personally would be the world-ender-level “Kudzu, the Everblight” (challenge 24 and by far not the most powerful thing herein…), a horrid, nigh unstoppable plant horror… Or what about trying to best the worldshaker, the animate form of the world’s very core? It needs to be said that this pdf, while a bestiary/monster manual-style supplement, is not a dry read – each of the kaiju featured within these pages comes with a well-written, neat story that elucidates the nature of the kaiju in question, often providing some rather cool ideas to use them in your game. Editing and formatting are very good, I noticed no serious hiccups. Layout adheres to Rite Publishing’s nice 2-column full-color standard and the pdf comes with gorgeous full-color artworks for the kaiju. The pdf is fully bookmarked for your convenience. You can get this cool collection of colossal creatures here on OBS!